Whatever your business, a mobile app will provide you with a number of benefits! To get an idea of what you can expect to see from your mobile, here are the top 4 features every mobile app should have! 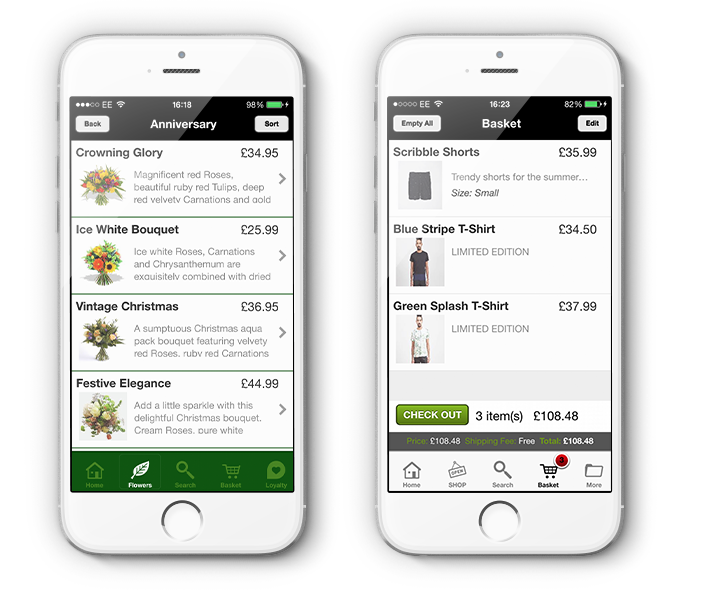 Create an unlimited number of products listings in your mobile store, and add images, descriptions, additional options and prices. You can list products by category, brand and keywords so customers can browse through your items and easily find what they are looking for. Your app will provide a simple shopping cart solution that integrates with web payments or PayPal for convenient mobile payments. Research shows that businesses who adopt a mobile shopping solution see an increase in sales. Shoppers who use mobile more, buy more. Research from Google Shopper Marketing Council shows that frequent smartphone shoppers spend an average of 50% more than regular smartphone users in Health & Beauty and 40% more in Appliances. Worldwide mobile commerce is estimated to reach £180Billion by 2018. 2014 saw more than 37% of online sales made via a smartphone or tablet device. UK shoppers spent £9.3bn on their smartphones and tablets in 2014. 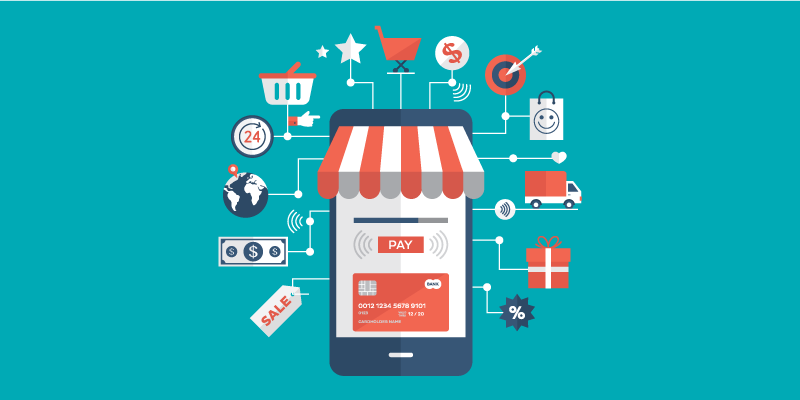 Discover How Mobile Technology Is Changing Retail. Customer loyalty and rewards apps are becoming more and more popular with mobile users. People love to be rewarded and therefore they enjoy signing up to loyalty programs because they know they are going to get something out of it. 80% of shoppers said their perception of retailers would improve if they offered mobile loyalty! [Source: Key Ring App]. 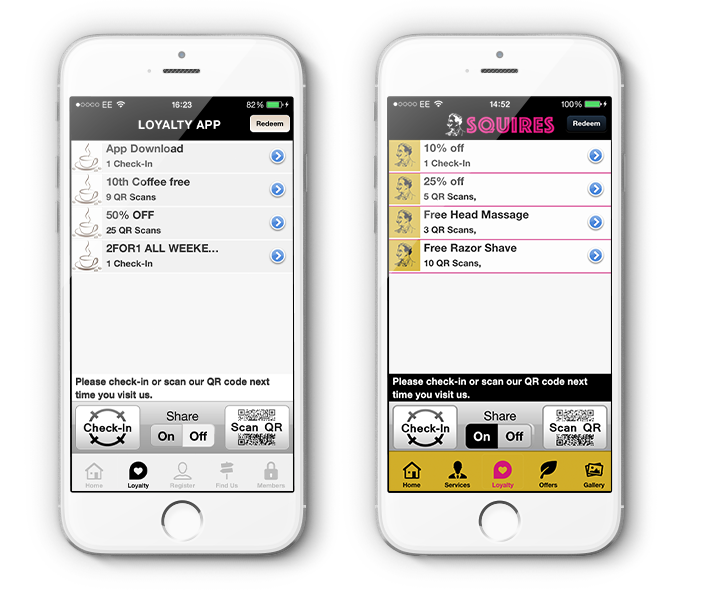 Offer a loyalty feature in your app that lets your users earn and build up point to win rewards. Earn points from location Check-In’s & QR code scans. 73% of smartphone users prefer mobile accessible loyalty programs. 95% of people who enrolled in a mobile loyalty program said they were likely to continue using it. 59% of people would be more likely to join a loyalty program that offered a smartphone app. 80% of shoppers said their perception of retailers would improve if they offered mobile loyalty. Increased customer satisfaction and retention levels. Research finds that 62% of customers report that they are more likely to continue doing business with a company that has a loyalty program. Create custom forms to capture all kinds of information from your app users. 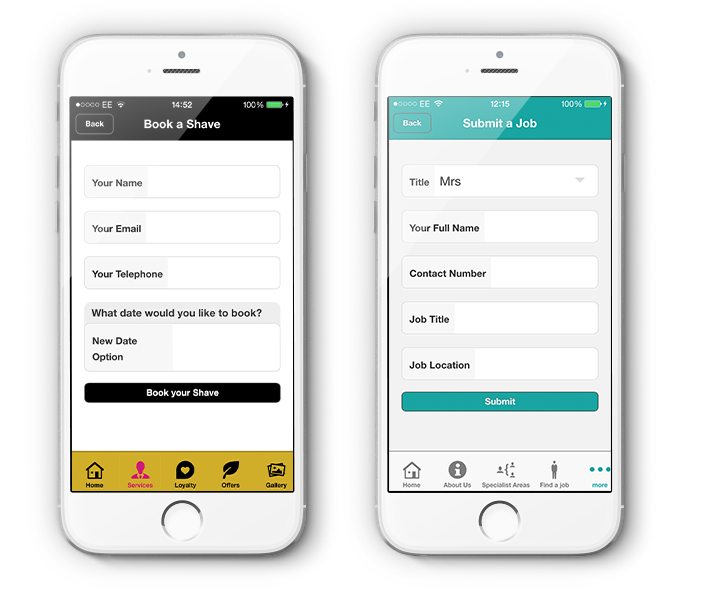 You can offer booking forms that allow reservations and appointments to be made, forms where users can easily enquire, upload images, join memberships and simple customer feedback forms to find out what your users think about your app. Customise Forms and make them what you want! Allow convenient customer bookings and a simple way to make enquiries. Remove the stress of making bookings and enquiries over the phone and struggling to hear over the noise of a busy environment. 78% of consumers use apps for customer service purposes. 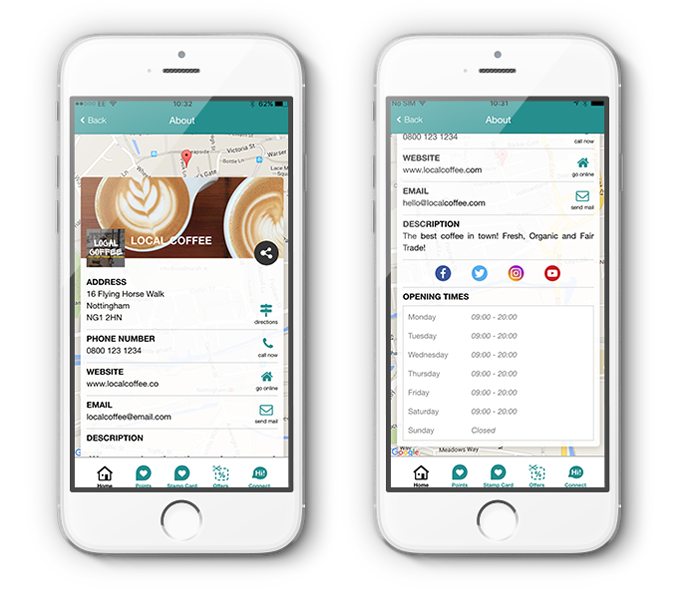 Include all your important business information, such as contact details like your telephone number so people can reach you, your email address so people can enquire via email and your business address so people know how to get to your business location. Don’t forget to add a description to your “About” section so users know what it is that you do. Connect your app to your social media channels to keep users up-to-date. Users can also recommend your app and share business information with friends. 65% of consumers download a business specific app for more convenient access to information.